Everton and England midfielder Ross Barkley has suffered a broken toe along with a six week time out on the sidelines. This injury has come after the emphatic 4-0 victory Harry Redknapp’s Championship side Queens Park Rangers earlier this month (4th January). Due to the injury; the England hopeful will now miss the next seven matches of Everton’s 2013/14 campaign; meaning he will miss the crucial matches of the Merseyside derby clash at Anfield against league contenders Liverpool (28th January); a trip to White Hart Lane, the home of Tottenham Hotspur (9th February) and a trip to fellow title contenders Chelsea at Stamford Bridge (22nd February). It also means the youngster will miss the fourth round of the F.A Cup tie against Sky Bet League One opposition and strugglers in that division, Stevenage Borough(25th January). This injury is similar to the one Leighton Baines suffered back in November when the full-back fractured his toe in the Merseyside Derby against Liverpool; seeing him miss the next six matches. This has left Toffees manager Roberto Martinez with another injury concern as defenders Sylvain Distin, Antolin Alcaraz and skipper Phil Jagielka; and winger Gerard Deulofeu all sitting out on the sidelines with injuries (Both Phil Jagielka and Sylvain Distin set to return within the next couple of weeks). The absence of Gerard Deulofeu is not much of a concern, following the signing of Republic of Ireland winger Aiden McGeady for an undisclosed fee. The youngster’s excellent displays have seen him receive England call-ups and interest from Manchester United and Chelsea. Manager Martinez may wish to fill in the voids of the absent defenders but no targets have been rumoured or confirmed as of yet; although it does seem to be a possibility. 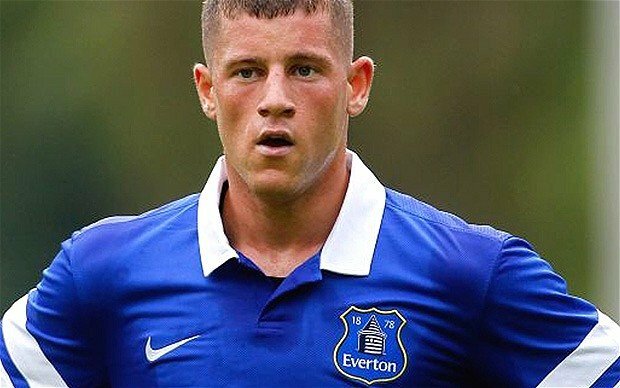 The injury of Barkley means that he will be missing for Everton’s next game against Premier League strugglers West Brom who currently lie 14th in the table, just 3 points from safety. Everton will be looking to wrap up in what appears to be a comfortable and deserved three points after a superb campaign so far to the 2013/14 season having only lost two of their last 21 Premier League matches. The only known player to fill in the void of Barkley will be long-term serviceman Leon Osman who has netted 3 goals this season and with Ross injured, Osman will be looking to prove a point and cement his place in the centre attacking midfielder position. This injury could mean that the youngster could put a slight dent in his chances of booking a place in Roy Hodgson’s squad which will be playing in the 2014 World Cup in Brazil. The chance has come after the midfielder has put in excellent and consistent performances this season along with 4 stunning goals.